Christmas has already begun at the Taylor house. First, my grandparents showered Jackson and Audrey last weekend. Now it was Ross' parents' turn. They gave Jackson an early Christmas present so we wouldn't have to haul it home at Christmas time, which we very much appreciate! His first call on the radio was, "I love you, Mommy!" Talk about a heartmelting moment. After all of that excitement, Jackson also got to pick out our Christmas trees...that's right...more than one. We got our standard tree for the living room, but Jackson also wanted a little tree, which of course we got since he said, "Please!". How can you say no to that? This was Audrey's first experience with a Christmas tree, and so far I think she likes it! 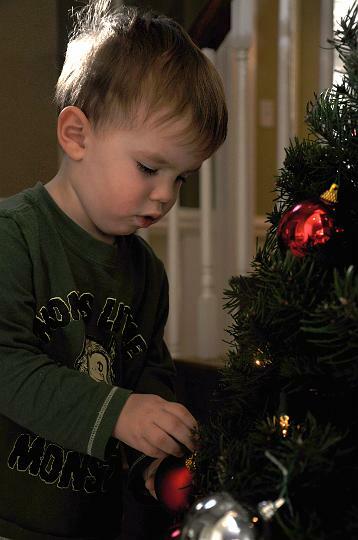 Jackson worked hard decorating his little tree today, and it turned out adorable. Here he is hard at work. We attempted to get some pictures of Jackson and Audrey and their cousin, Mitchell, this weekend. Here's what we got. We were never able to get all 3 to cooperate, but they are still some of the cutest kiddos ever! Mitchell had just woken up from a nap, so getting a smile out of him was tough. He's one of the happiest babies in the world, but you probably wouldn't be excited about having a camera in your face just after you woke up either. There are more pics of these adorable kiddos in the album. The 4th part of our Thanksgiving celebration was the big meal with the Taylor family, and it was a great day! We did an evening meal, so the day started with some good, relaxing play time. This is our adorable nephew, Mitchell, who gives the 2nd best hugs in the world...Jackson is 1st. Jackson and Audrey loved playing with their cousin and each other! Our first attempt at cooking a Thanksgiving meal for the family turned out pretty good thanks to years of watching others, as well as some help from my Grandparents and Ross' family. Ross was the primary chef this year, and he did an amazing job! We have lots of left overs if anyone out there is still hungry! Special thanks to this wonderful couple, Ross' Mom and Dad, not only for helping us this weekend, but also for the years of teaching you've done and the wonderful example you have set! Today was the Thanksgiving Feast at Jackson and Audrey's school. We spent the majority of our time hanging out in Jackson's room, and he had a blast. Here are a few pictures, and there are more in the album. While we were playing, Ross was busy helping out by carving the turkey for the feast. Thanks Ross!